The 41st Anniversary Charlotte Mini-Con will take place THIS SATURDAY, January 27, 2018 at the Grady Cole Center located at 310 N. Kings Drive, Charlotte NC 28204. The show opens to the public at 11am and will close at 5pm. Tickets are $5.00 in ADVANCE and are available here. Advance Ticket holders will gain entry to the convention floor up to 30 minutes before “DAY OF” ticket holders. Tickets will be available at the door for $5.00 to attendees 13 years and older. Children 12 and under always get in FREE! There are options for FREE Public Parking within reasonable walking distance of the Grady Cole Center off of Elizabeth Avenue and off of 7th Street. The following shows Free Public Parking Areas in blue, and $5.00 Cash Parking Areas in yellow. You might also consider utilizing the *CityLYNX Gold Line Trolley* that runs up and down Elizabeth Avenue with a stop at Elizabeth Avenue and Kings Drive, just down the street from the Grady Cole Center. The CityLYNX Gold Line is FREE. 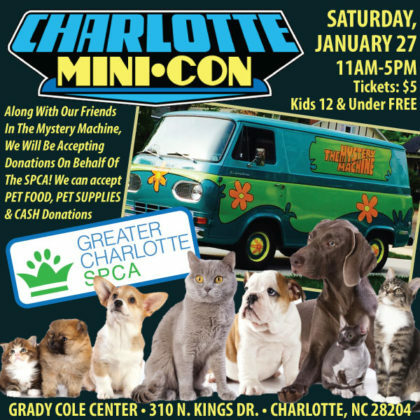 The Charlotte Mini-Con, along with our friends who own the Mystery Machine, will be collecting donations on behalf of the Greater Charlotte SPCA. We will be accepting donations of Pet Food, Pet Supplies and monetary donations to benefit our less-fortunate four-legged friends! While we will not be holding a Costume Contest at our 2018 show, the Charlotte Mini-Con encourages attendees who wish to attend in costume to come out and have fun! Please be advised that there will be a weapons check at the door and that all costume props must be either wooden or plastic to comply with the Grady Cole Center weapons policy. All replica weapons will need to be inspected and approved as a non-functional prop at the door before they will be allowed inside the Grady Cole Center. No metal weaponry of any kind will be allowed inside the Grady Cole Center. We appreciate your understanding and look forward to seeing all the great costumes this weekend!